The complete series of historical and legal documents for managing the water resources of the Colorado River, and collectively known as "The Law of the River," were first compiled in 1933 by the Department of Interior. The series were periodically updated through the years and cited as The Hoover Dam Documents. The entire collection was recently archived digitally by the Bureau of Reclamation and presented to the public on DVD media at the 2010 annual meeting of the Colorado River Water Users Association at Caesar's Palace, Las Vegas. In these documents you will find a legal history of problem solving to deliver water in an arid landscape to seven states, one foreign country, scores of sovereign tribes and, as an after thought, without entirely extinguishing its native wildlife and stunning wilderness. The Law of the River has more to do. It has yet to control sediment, aging infrastructure, earthquake damage, invasive species, probable maximum floods, severe and sustained drought, and climate change. Solving the most challenging of problems for last, will make Part Five of the Hoover Dam Documents the most interesting to assemble and read. The following files are searchable using PDF viewer clients for operating systems both Mac and Windows. 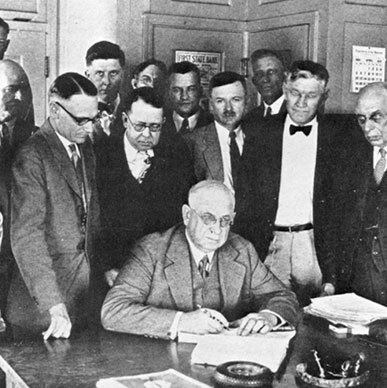 Part I: The 1933 Hoover Dam Documents were compiled by Ray Lyman Wilbur, who was Interior Secretary in the Hoover administration (1929-1932), and his executive secretary Northcutt Ely, who would later represent the State of California in the Supreme Court decision known as Arizona vs. California. Part II: The 1948 Hoover Dam Documents was an update compiled again by Ray Lyman Wilbur and Northcutt Ely. Part III: The 1978 Hoover Dam Documents were compiled by Milton N. Nathanson for the Bureau of Reclamation. Part IV: The 2008 Hoover Dam Documents were compiled by Robert Johnson, the Commissioner of the Bureau of Reclamation from 2006 - 2009. 2007 - UCRC water availibilty from Flaming Gorge Reservoir.